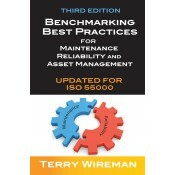 Benchmarking Best Practices for Maintenance, Reliability and Asset Management, Third Edition. Updated to account for ISO 55000, Benchmarking Best Practices for Maintenance, Reliability and Asset Management, Third Edition, now includes an overview of this seminal and long-awaited standard and identifies the specific points where ISO 55000 will impact maintenance and reliability. New graphics to enhance the text’s main points have been added throughout. As with past editions, the third edition provides a logical, step-by-step methodology that will enable any company to properly benchmark its maintenance function. It presents an overview of the benchmarking process, a detailed form for surveying and “grading” maintenance management, and a database of the results of more than 100 companies that have used this survey. Widely used, Benchmarking Best Practices for Maintenance, Reliability and Asset Management, Third Edition, has proven to be an invaluable planning guide and on-the-job reference for maintenance managers, plant engineers, operations managers, and plant managers. Terry Wireman is a widely-known and respected Consultative Educator, specializing in the improvement of maintenance and asset management for clients. Using techniques and tools such as CMMS and Total Productive Maintenance, his focus is on helping clients develop “World Class” maintenance and asset management policies and practices. As an international expert, he has assisted literally hundreds of clients in North America, Europe, and the Pacific Rim improve their maintenance and asset management effectiveness. He has authored over 20 textbooks and was a member of the U.S. TAG, providing input into the ISO-55000 document. Terry is currently the Senior Vice President – Strategy of Vesta Partners, LLC, where his responsibilities include developing return on investment case studies and site cost-benefit analyses.